Jordan Tucker dribbles the ball up the court. Tucker and the Bulldogs face DePaul on Jan. 16. Jimmy Lafakis/Collegian file photo. 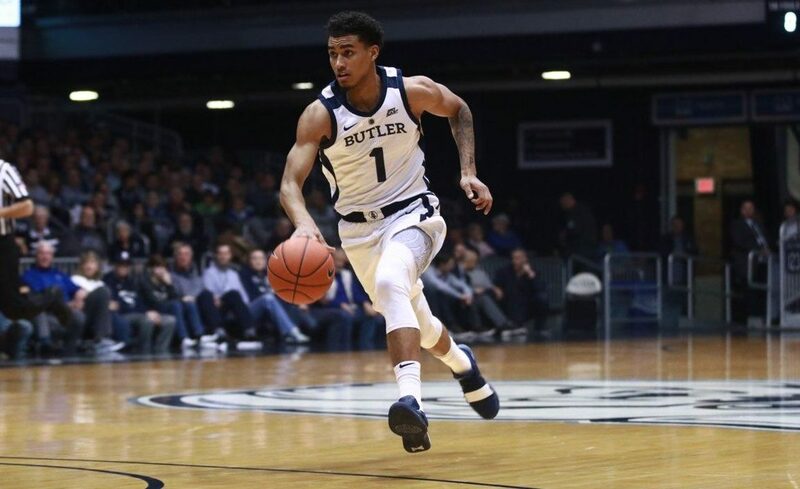 Losers of two straight, the Butler men’s basketball team heads to Chicago to take on the DePaul Blue Demons in the Windy City. Here’s what you need to know. Butler needs a win to gain some momentum because the next two weeks are not easy. Butler has lost four of its last five games and is in the midst of a two-game losing streak. Granted, three of those five games were on the road, but the Bulldogs gave up a second-half lead at Seton Hall before blowing a 10-point lead in the final four minutes at Xavier. While the Blue Demons have a better conference record, they still sit outside the top 100 in KenPom and Butler has more talent on the floor. Once again the Bulldogs are going on the road and playing a team they have the potential to beat. It’s about time they win one because they need it bad. Forget about NCAA Tournament aspirations for a moment, the Bulldogs, in the next two weeks, play both Big East teams currently in the AP Top 25. They also play St. John’s, who was ranked 24th last week. All three of those games are inside Hinkle Fieldhouse, but a road win before they begin this tough portion of the schedule would give the Bulldogs confidence and a much-needed road win in conference play. Max Strus has scored in double-figures in 12 of DePaul’s 15 contests and has four performances of 25 points or more. The senior stands at 6-foot-6 and can score in bunches from all over the floor. Five times this season he has connected on five or more threes in a contest. The Bulldogs’ defense has already been subject to three 23-point or more performances in Big East play and Strus might be the best 3-point shooter they’ve seen thus far. He is going to take his shots and get his buckets, but good perimeter defense could force him into his habits of inefficiency. The Bulldogs do not rebound the ball well. They are currently 320th in the country in rebounds per game. Kamar Baldwin is the team’s leading rebounder with two 6-foot-11 guys on the roster. Meanwhile, DePaul is a very good rebounding team, pulling down 39 rebounds per contest which puts the Blue Demons in the top 50 nationally. They also grab 12 offensive rebounds per game. It’s crucial the Bulldogs rebound well to grab a couple extra possessions throughout the game and prevent the Blue Demons from racking up second-chance points. On the other hand, the Bulldogs have a clear advantage around the 3-point line. Paul Jorgensen, Sean McDermott and Jordan Tucker all shoot better than 38 percent from the 3-point line as Butler knocks down 36.7 percent of its threes as a team. The Blue Demons rank 281st in the country in 3-point shooting and they only make 6.6 threes per game. This matchup features two teams that cite advantages in different areas and the team that eliminates the other’s advantage will probably come away with the victory.